I've chosen to highlight these two books at the same time for obvious reasons. They are both so equally awesome, I couldn't choose one over the other to focus on. 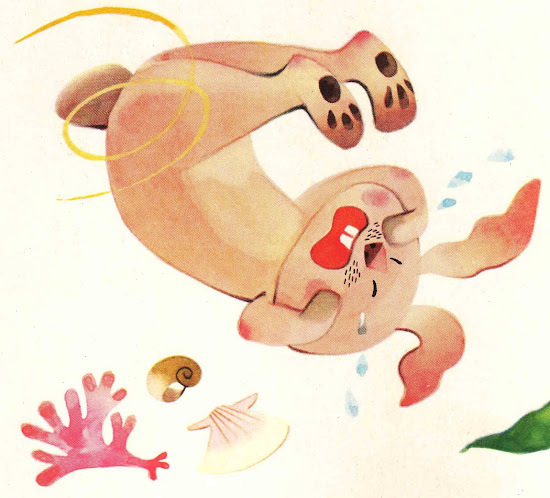 Like some wacked-out Japanese Provensen, the illustrations by Suzuki are stunning! And the stories so endearing and interesting, they make me want to know more about Asian legends. 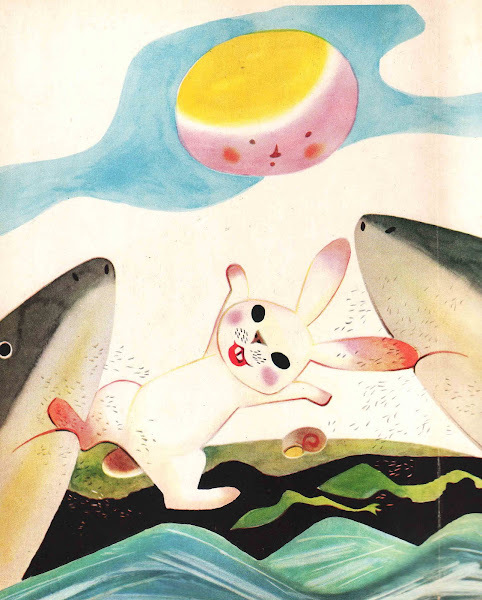 White Rabbit lived on an island in the sea. It was a pretty island, but he wasn't happy there. 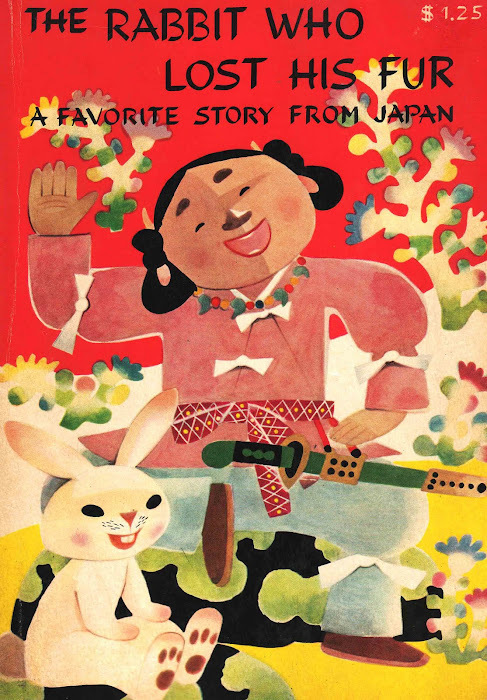 To tell the truth, he was very lonely because he was the only rabbit on the island. What he wanted more than anything else was to go to the mainland country that he could see across the wide stretch of water. Every day White Rabbit would stand on the shore, looking across at the mainland and wondering: How can I get there? Are there any rabbits there? How to get across indeed. 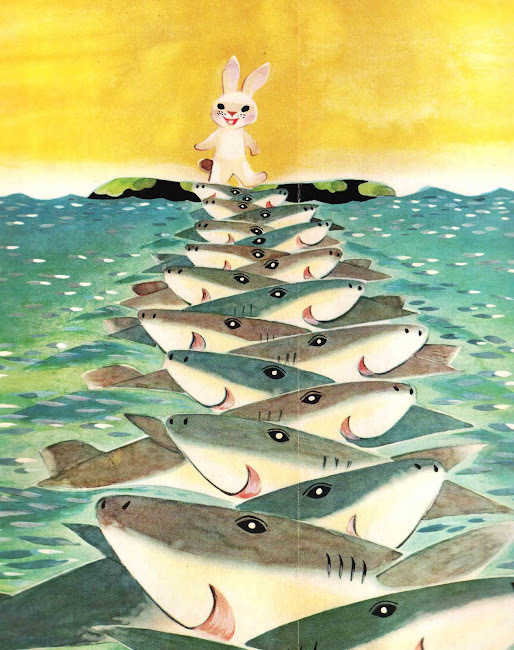 The rabbit meets a shark and tricks the shark into gathering all of his shark friends so that he may count them, thus tricking the sharks into letting him cross to the mainland across their backs. When the sharks realize they have been duped, they shave the rabbit of his fur in disgust. 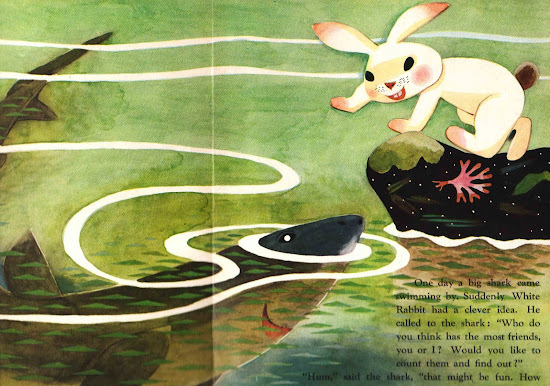 The bare rabbit is quickly spotted by some chieftains who tell him to take a bath in the sea, thus tricking the rabbit into burning the bejesus out of his skin. Pitiful and crying, he meets another (gentle) chieftain who helps him camouflage his nakedness with cattail fur... Thus the lesson, those who fool others, only make fools of themselves. The badger himself is what the Janasese call tanuki, an animal they have long admired for its cleverness and its comical qualities. 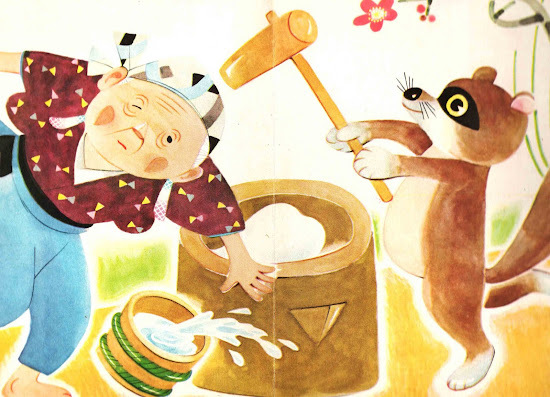 Since the tanuki is easily tamed, it has from ancient times been favored as a pet and has been the subject of numerous children's stories. It is traditionally believed capable of bewitching human beings and of taking human form in order to do mischief. 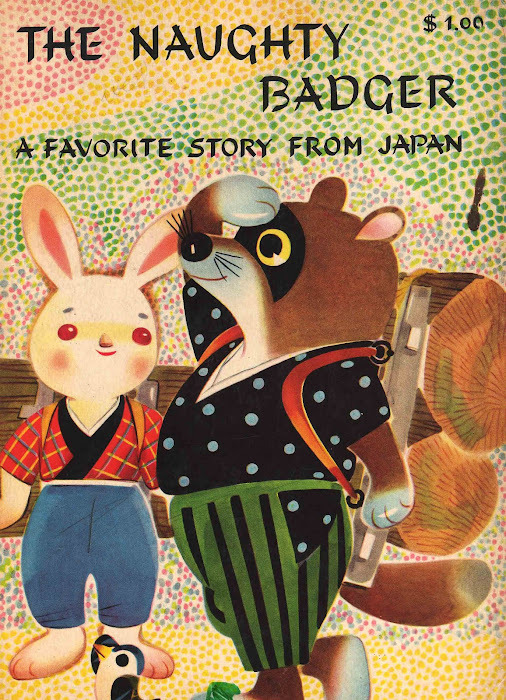 This theme is the subject of the eco-film Pom Poko by Isao Takahata about raccoons who try to stop developers from turning their forest into suburbs. (My son loved this movie as the animal characters change from crude drawings to more modern realistic creatures throughout the film.) 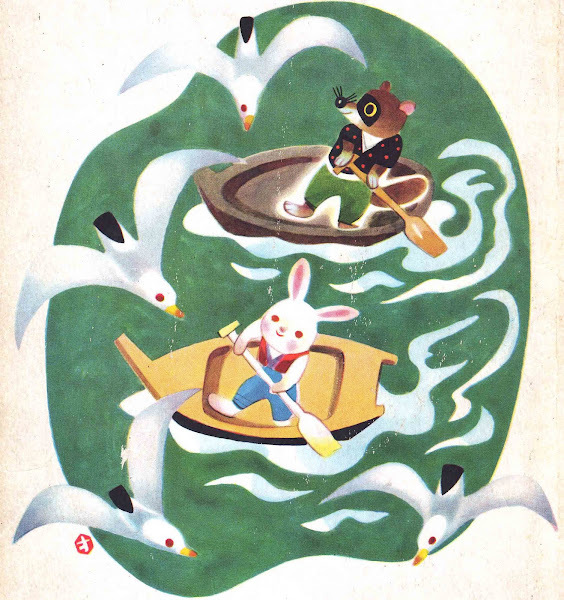 If anyone knows, help me out here, but the illustrator has the same name as the president and one of the founders of the Studio Ghibli, Japan's leading animation production house where Pom Poko, Spirited Away, My Neighbor Totoro and more recently, Ponyo were created. I don't think they are the same person as the Wiki says the filmmaker was born in 1948, and that would make him anywhere between 9 and 12 when he illustrated these books. Seems unlikely, but who knows. Maybe it's his Dad. Anyone? I love the humor with added morals. True classics! I've never seen these, but they are awesome looking. I would guess that the illustrator isn't the same person as the producer of those films. I think Suzuki is a common last name, and Toshio is a common name too. i love the picture of all the fish poking out of the water! those are the sharks, aren't they great!?! i hope someone shows up with an answer... i'd be interested to know if there is a connection... the pictures of the sharks just knock my socks off. This looks awesome. I'll have to try and find one. This is a great find! One possible correction, though. There is the Japanese badger (anaguma), and also the native Japanese raccoon dog (tanuki) - and this creature looks more like the former.